All dogs are special and have their own behavior, health, and activity requirements. Some dogs are what we may consider special-needs dogs or senior dogs that may need a little help with their daily lives or activities. This, however, does not mean that these dogs do not deserve to lead a happy, fun, and healthy lifestyle. A special-needs dog may have just a few needs or requirements to help them enjoy life to the fullest. 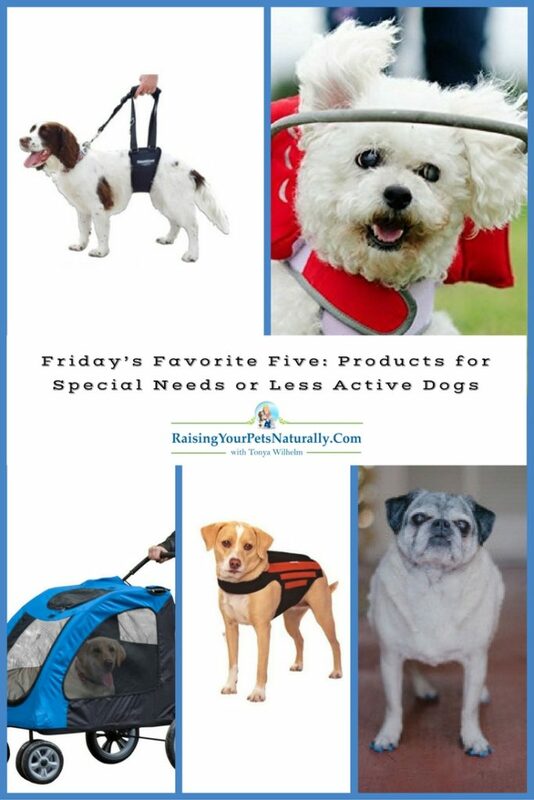 I thought today would be a great day to spotlight 5 amazing products and brands that help our special dogs LIVE LIFE! 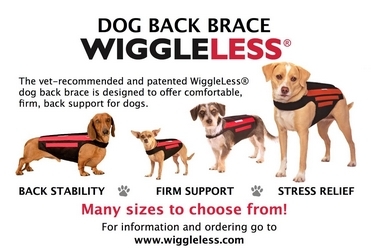 “WiggleLess has a unique and innovative design which aids in spinal column support and activity restriction in dogs. This dog back brace limits many of the movements which are known to contribute to back injuries as well as provides back support that can help prevent further exacerbation of some existing spinal conditions.” Amber Brooks, DVM Knoxville, TN Order Today! Ever wonder why dogs slip on hard floors? Dogs use their nails for traction—engaging them like cleats digging into the ground. But hard nails can’t grip hard floors. 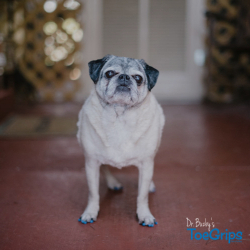 ToeGrips are nonslip grips that fit onto dogs’ toenails to restore their natural ability to grip with their nails. Help your dog turn back the clock and rediscover confident mobility with ToeGrips. Read my review or Order Today! 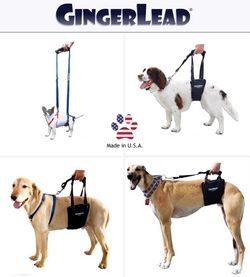 GingerLead dog slings help aging or handicapped dogs with mobility and dogs recovering from orthopedic problems or procedures. They are easy to use, padded, adjustable for height, include an integrated leash for control and are machine washable. Sizes available for toy to giant breeds. Recommended by Veterinarians. Made in USA. Order Today! Pet Gear Pet Strollers are used for a variety of reasons. They help avoid stress on your pet’s body if they are having trouble walking due to joint pain, arthritis, or recent surgery. Strollers also function as a crate on wheels. 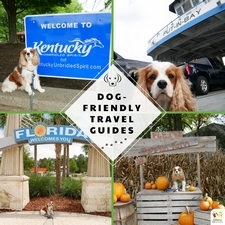 Wherever you go, your pet, whether it be a dog, cat, furry friend, will be able to keep you company while remaining safely contained inside the stroller. Order Today! Muffin’s Halo Guide for Blind Dogs is a 3 piece must-have device that helps blind dogs transition to becoming familiar with existing or new surroundings quickly. It starts as a harness that is wrapped snuggly around a dog’s neck and torso. The wing attaches to the neck of the harness. The halo is attached to the wing and when placed on the neck of the harness, the halo is just above the eye level and acts as a buffer to safeguard a blind dog’s head, nose, face and shoulders from bumping into hard surfaces. Order Today! Would any of these products help your dog? Tell me in the comments. Wow did not know they had a dog back brace, we have two weiner dogs and worry about their backs all the time. This would help protect them!! Thanks, Kathy. 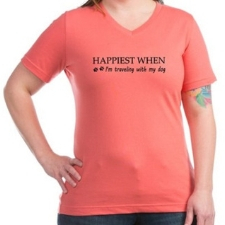 Definitely, check out WiggleLess, she’s a wiener mom too! Oh wow, I didn’t know they had these many products for special need dogs. I have seen the strollers and it always brings a smile to my face when I see it. Yes, we use our stroller a lot! Dexter just can’t keep up with our activity and he still wants to go, so I pop him into the stroller. He rests, then usually he’s back out. Thank, you Divya. You made my day. My dog has special needs and we also do therapy dog visits with special needs students. Talk about a feel good day! I love these items, halo is such a brilliant idea. I know a blind dog that walking into a cabinet corner and burst her eye, it was horrible. I can see the halo really helping prevent bumps like that. Oh, no. How terrible. We are so lucky to have some great companies helping our pets lead great lives. I’m so happy they’ve come up with all these products for senior dogs now! Sadly our dog passed a few years ago (he was 12 human years so a long and happy life) but we would have loved stroller for sure! I’m so sorry for your loss. It’s never easy to lose a family member. Not gonna lie, the idea of toe grips is hilarious. But hey, if it can keep them from having a Scooby doo running in place moment, they’re definitely worth a try. My dog wears his ToeGrips daily. For him, they assist him with his neurological condition and help him lift his back feet because he’s more aware they are there. Amazing product. Thanks, Neha. It’s so nice to have products that can help our dogs live life to the fullest. They truly are amazing creatures. This products look amazing. My Balck Lab had surgery six month ago on her leg. If I knew about some of this products she wpuld be fine much much sooner. She is good now happy and running areound as allways. I’m so glad your lab is doing well. Yes, there are a few here, ToeGrops and GingerLead that would have really helped with recovery. Toe grips! What! I have a rather hyper pup and these would be great. I wonder if they help prevent damage to the floors too, which in my case would be a added plus! They actually don’t recommend them for puppies because they tend to chew everything up! haha I don’t know about the floors, I will try to look into that. This has really opened my eyes! I had no idea there was special needs dogs, I guess I never really thought about it but of course there will be dogs who are less able! How fantastic that there are things to help! <3 Thanks. Yes, so many things can impair the way a dog may live life. Luckily we have products like these that can help! Sure thing. I love sharing helpful products with people. Thanks for sharing all of these! I love the stroller – definitely a good way to get fresh air without your dog having to hurt too much if they have trouble walking. Thanks, Lauren. We totally love our stroller. Thanks for sharing these products. I never heard about these products but now i would love to buy them for my little dog. These are such incredibles products. Wish they had more display in pet stores everywhere. Yes. It seems that large pet stores don’t seem to have the best products. With these products, most need to be specially fitted or measured properly. Wow, my little pom needs those toe grips for her nails, she is terrified of slippy floors! Thanks for sharing, thats a game changer. Sure thing. We love our ToeGrips. Amazing product. I love the dog cart. The dog looks so relaxed in there. Good for when they’re tired. Thanks. We use our dog stroller during every vacation! My dog is still young and very active but I had an elderly bichon before I had my sheltie and he benefitted a lot of having a stroller. He lived 21 yrs. Still miss him. I’m sorry for your loss. 21 is amazing! What a great resource for owners of special needs dogs. I will be sharing this with a couple friends. Thank, you Tami. I totally love these 5 products and use a lot of them myself. It has been a long time since I’ve had a dog with special needs. I am so glad to see the many options available now! Thanks. I’m so thrilled that brands are looking for ways to help our dogs live to their full potential. Our Cocker Spaniel was blind from glaucoma for the last 8 years of her life. We had one accident resulting in a small corneal abrasion and that was my fault. There is a learning curve in dealing with a newly blind dog, especially those who still have their actual eyes. Those eyes need to be protected and they can be very vulnerable to an assortment of everyday hazards. We had a hoop custom made for us by a friend but with the same general design as the Muffin halo. It was a lifesaver in strange places. We traveled. A lot of different motel rooms. After a few different rooms and wearing her hoop, Bonnie could map out the room within 5 minutes with her water bowl as the center piece. It was worth every stitch. Thank you for sharing all these wonderful products! They have come so far in what we can do to help special needs. Sure thing. Yes. It’s so wonderful that people are really developing some amazing things for our special dogs. The future is bright! Thanks. Sure thing. We currently use 2 (Pet Gear stroller and ToeGrips), and may need the other 3 in the future. These are all great products. That halo is particularly cool. I remember seeing it at Blogpaws last year. Really? That’s awesome! These are 5 really great products and brands. There are so many great products on the market for dogs that I didn’t know existed! I think some of these may work for my senior dog clients. Thank you. This is such wonderful information! Our pug died when he was 12 and the final year of his life we used a number of these things. The back brace (especially for older pugs) is a must. Their breed can have spinal issues .. in fact at one point he had to have surgery to repair a disk that was pushing on his spinal column. And the stroller made me smile. We had one and took it with us for when he got too tired to walk anymore. Mr. N doesn’t really need any of these but I use a stroller for him sometimes in crowded situations. He’s very happy to walk but sometimes it’s not safe to do so. Exactly! Dexter had his stroller during an outdoor new year party last year. It kept him safe from all the goofy people. I’ve also popped him in, to cross black tops. I don’t have dogs but I’ll send this post right away to a couple of friends very into the dogs that can truly have benefits from your tips! Thank you. I am sure your friend will appreciate the share. I have a 1-yr old terrier named Chubby2. These are amazing dog products. Iam thinking about getting him a back support. Chubby2, that’s great! I’m looking at the WiggleLess support for Dexter too. The company is great, feel free to reach out to them with any questions. Honestly, I had no idea that such products existed! They seem very helpful, I will definitely share your post with a friend of mine that has a dog. I was quite impressed by the Pet Stroller! 🙂 I’ve never seen one before, but it’s so useful for pets. Thanks, Rodanthi. I think it’s important to share the amazing products we have to help our special pets lead great lives. I’m sure your friend’s dog will thank you. Aww, this is so important because our pets are really a part of our family. We have to take special care of them as they get older. Thanks. I totally agree. In my early years of my career, I worked at an animal shelter. People often brought their old pets in because they didn’t want to care for them! It broke my heart. Thanks for letting me know that there are products like these for special needs dogs. My 4 year old Shih Tzu is getting to be a bit on the heavy side and I don’t want any extra strain on his spine because of his sagging belly. I might get a brace for him. Best thing though is to put him on a diet and get him to do more exercise to shed off that excess weight. What great recommendations. I ‘ll have to forward this post to a few on my friends with elderly dogs. I think they can use at least 2 of the items- gingerlead and the stroller. Thanks for sharing. I’m working on reviewing the GingerLead right now. It’s amazing and a great quality! These are all great products, I especially like the GingerLead and Muffin’s Halo. These are all really helpful for dogs with special needs. Thanks for sharing. Sure thing. Yes, great items. I’m working on a review of GingerLead right now. It’s a great product, fantastic quality and Dex may need it in the future. I’m familiar with some of these. Muffin’s Halo was an BlogPaws last year. I LOVE the idea behind that product! Got a stroller for my dogs to go to big events. J.R. is ok, but April gets very scared around crowds, thought this would be a way for both of them to go to charity walks, etc and feel safe and secure. It’s great that so many products are available for senior pets now so life can be as easy as possible for them. They deserve it! We met the Gingerlead people at BlogPaws 2016. They are the most committed people on the whole planet. Their idea is so ingenious but helpful and it works! Lucky! I’m working with Barry on a review right now. Super nice folk and a quality product. Wow Tonya – I had no many idea of the variety of products out there! I feel foolish now, but I’ve only known of ramps (for cars) or steps to reach a bed. The back brace would have been perfect for my Marron (RIP). As my remaining dog, Marilyn, ages, several of these products will be useful. It’s always sad to see a dog age. Sometimes it seems to happen overnight, doesn’t it? I know I’ll be referring back to this post, and telling friends about it too! I’ve seriously considered purchasing a stroller so I could travel with the girls. I need to get them adjusted to a harness and leash first, though. 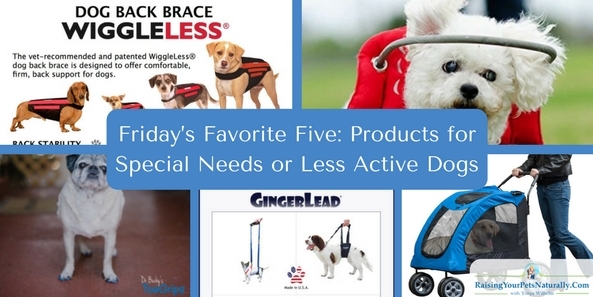 It makes me happy to see how many products are coming out to help disabled and aging pets. That really says something about how much people love their pets! I’ve met the creator of Muffin’s Halo. She is a wonderful and giving person. She helped out a blind dog in my local rescue when I asked! I can’t thank her enough. That’s a wonderful story! How fun it would be to meet such a great person. I’m excited to be able to meet Dr. Buzby in a few weeks. I want to thank her in person for everything she has done for Dexter. I had never heard of the back brace. That is great to know about. We have seen the benefits of the ToeGrips and frequently recommend them to our friends with older dogs who are suffering from mobility issues or younger dogs with neurological disorders. Thanks for this great lineup. I’m sure a lot of pet parents will benefit knowing about these helpful resources. Thanks, Bryn. 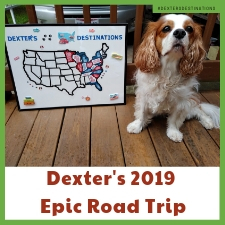 Yes, our ToeGrips have helped Dexter with his neurological condition. They really help him become more aware of his back feet. Oh wow, these are super cool! I think so too. So helpful for our special dogs. Love these products and brands. My niece’s dog could definitely use the wiggleless. I’m going to tell her about that one for sure. Fantastic! WiggleLess is such a great company and so helpful for our dogs. We just rescued a puppy so we really aren’t in need of these things right now, but you never know what might happen in the future! I’ll bookmark. Very informative it’s good for all pet owners to know about these resources! I did not know there were so many accessories and gear available for dogs out there! That’s great! I think it’s great that these brands are out there supporting our dogs. OMG! I didn’t know that dogs have their own stroller too designed only for them. Glad that I found this post! I always take Dexter’s stroller on all of our adventures. A must for us. My neighbor bought the brace for his dog. He and I were talking about how it works for his dog. He seems to like it! That’s fantastic! Glad his dog is doing well. So cool! I like that there is so much out there to help with special needs pets. Me too. These products and brands are amazing! love the stroller! my dog isn’t old or anything, but refuses to walk in the rain – he still wants to go for a walk though, and will whine all day! this could solve that issue. Great information to know! Our dog turned 9 this year and I am noticing small changes in her health and hips. Wow!! 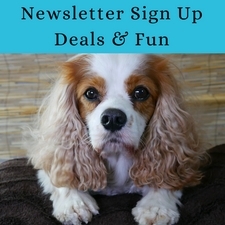 So many great products for special needs dogs! Amazing info. Thanks. I love these brands and how they are helping our dogs live a better life. Glad to share. Happy to share these great products and brands. 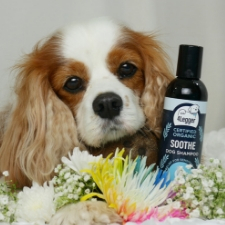 I am so glad more and more products are being made to help our special dogs. It is so amazing, I never realised that there were so many aids available for special needs or less active dogs. As they say, “you live and you learn”. Glad to share. Anything to help our special dogs. Wow, those are interesting and thoughtful products. How neat that there is a device so blind dogs don’t bump into things. It’s nice that these are available for pet owners. Thanks, Marysa. Muffin’s Halo is really a great product and brand. So nice to have so many great options for our dogs. These are some great products for dogs. Dogs are an awesome and important family member so it’s important to take care of them! Thank you, Claire. They really are family members. ive always wanted a pet stroller, but my dog is over 70lbs so unless my husband can be convinced to get me a smaller pup, I don’t see this entering my life any time soon. I had no idea that they made back braces for dogs though, that could come in handy when my dog finally gets to that age where mobility is lessened. Your tips are very helpful, and I will consider some of these goodies for my friend’s dog. I had no idea there were so many things out there to help special needs dogs! I think this is so great. Finally something to extend their life and not just putting them down which happens all to often. Thank you so much for sharing, you might have saved some animals! <3 Oh, thank you. That makes me feel good. <3 Oh, that's great. Glad to help.